Cardigans are a versatile and so it's only natural you require a few for seasonal styling. This one has a soft jersey that's perfect for layering over other lightweight pieces and it makes a great topper to your sleeveless tops and dresses too. Love these - want more colors. I I own the black and navy. I also purchased the back pleat option in lavender. Don't hesitate -- all year wear. Love tunics and long jackets. This is a very nice Cardigan, drapes perfectly, very figure flattering and has shape to it, not boxy at all. The detail on the back gives a one of a kind designer touch. Im a curvy lady (32 waist and 41 hip) I usually wear a Medium/large depending on the designer but sized up to a large in her dresses and cardis so that they skim over my curves and not hug too tight. Personally after trying both med and large I think her designs run on the smaller side. 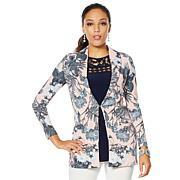 Really love the fabric of this Cardi! I am very pleased with this purchase in a Navy to wear casually with jeans. It is a good fabric weight and resists wrinkles. I also like the design details. My first Nina Leonard purchase. I may get an additional color. Love it. Flattering fit. Navy is perfect.